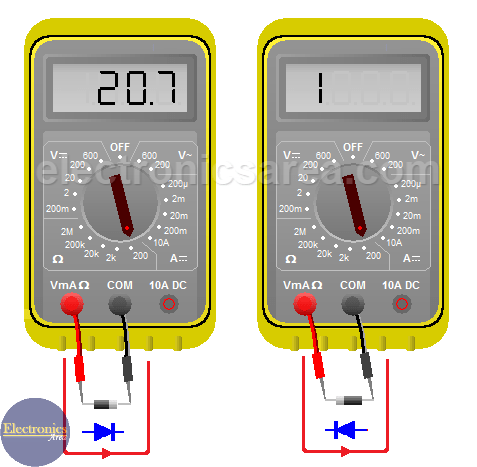 How to test Diodes and How to test Transistors using Multimeter? It is very important for an electronic technician to be able to determine if a diode is working well or not since it will allow him to make electronic devices to work properly. However not only technicians need to know that. For an electronics hobbyist, who is implementing a circuit or checking an electronic project, it is very important to know if there is any problem with the electronic components he is using. There are digital multimeters (VOM) that test a diode very easily, because it already comes with this option from the factory. I’ll show you a typical method to test diodes with an analog VOM (it also works with a digital multimeter). First, the selector must be positioned to measure resistance (ohms), regardless of the scale. We do the following test on the picture above. 1 – Join the red lead probe with the anode of the diode (the no strip side) and the black lead probe with the cathode (the strip side). The VOM will inject a continuous current to the diode. If the VOM shows low resistance, it means that the diode is forward biased and it is working fine. 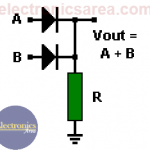 If this resistance is very high, it may be a sign that it is an open diode and it has to be replaced. 2 – Join the red probe lead with the cathode and the black one with the anode. As in the previous case, we want to have a current flowing through the diode, but now on the opposite direction (from cathode to anode). If the reading shows a very high resistance, then the diode behaves as expected because a it is reverse biased and there is almost not current flow. If the readings shows a very low resistance this could mean that the diode is in “short” and it has to be replaced. The red probe should be connected to the terminal of the same color in the multimeter. The black probe should be connected to the terminal of the same color in the multimeter (common). To test transistors, the equivalent circuit of the NPN and PNP bipolar transistor is used. This equivalente circuit is composed of two diodes and we follow the same technique we used to test a common diode. The testing is performed between the base terminal (B) and the E and C terminals of the transistor. 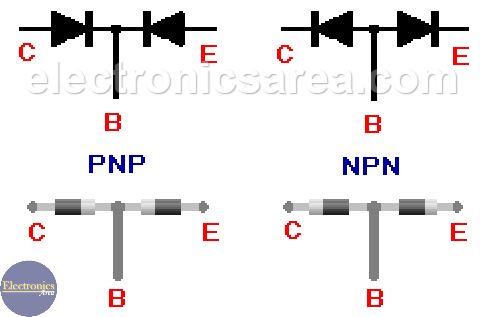 The NPN and PNP transistor have opposite methods. As in the common diode, if one of these “diodes” (the equivalent transistor “diodes”) does not work as expected, we have to change the transistor. Note: Although this method is very reliable (99% in all cases), there are some cases where this is not met due to the characteristics of the transistor or diode. It is suggested to take it as a 100% reliable for practical purposes. 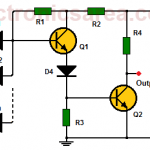 How to Make a Diode Tester Circuit using 741? Why is there a Diode Connected in Parallel to a Relay Coil?